Having a sandbox in your backyard can be great fun for small kids, but it can be a bit of a challenge to figure out how to keep cats out of sandboxes. Fortunately, if your cat, or other cats in the neighborhood, decide it's one big litter box, there are some ways to keep the cats out! If your cat is using the sandbox, the simplest way to keep him out is by keeping him indoors. It's the safest option and is recommended by humane societies and feline veterinarians. If your cat previously was an outdoor cat, he will need to adjust to an indoor only environment. You can help him by providing plenty of cat trees, shelves and perches, and toys for play. You could even train him to walk on a leash. If keeping your cat inside is not an option, or if the sandbox is being used by other cats, covering it is a simple solution. Not only does this option keep cats out of your sandbox, it also keepts it free from other items that might blow in there from wind and rain. You can make your own cover with some building supplies such as shade cloth, tarps, pallets, wood, PVC or chicken wire. The goal should be to make something that won't blow away with the wind or be easily moved by animals, but will still be easy for you to move on and off. If you're really handy, you can even make a cover that's attractive, functional, and includes seating. The Frame It All Telescoping Hexagon Sandbox Canopy and Cover converts from a shade canopy into a cover easily. You do need to have the accompanying hexagon-shaped sandbox for it to fit properly. The cover retails for about $140. Tarp Supply has simple tarp covers in many sizes as well as custom sizing. They're lightweight and easy to tie down and lift up. Tarps range in price from $55 to $350. Sandbox Covers USA sells weighted covers that don't require tying down because of the heavy edges. Covers run from $385 to $1,000 depending on size. Custom sizing is available. If you opt to fence-in your sandbox, you can either fence the area around the box itself or fence your yard overall. Keep in mind that fencing may not work unless you cat-proof the fence, as cats have been known to scale fences. One option for cat-proofing a fence is to use coyote rollers. If you decide to fence just the area around the box, consider using fencing designed to be rabbit proof which has a higher chance of keeping the cats out. A more attractive option could be to use small garden fencing. Run two lengths of it a few inches apart around the box to help prevent cats from jumping in. There are commercially made scent deterrents for cats, such as Scram for Cats and Shake Away, but their efficacy varies widely. There are also many stories about home remedies (in the form of scents) that repel cats. You may want to try one or more of these options, but be aware that success with these varies depending on the cats, as not all cats dislike the same scents. Additionally, placing any scented item outdoors allows the scent's strength to quickly dissipate, even if you regularly spray the area. Caution: Some of these can be toxic to dogs, so be sure to research them first if there are dogs in your yard. There are plants that many cats find distasteful because of their scent. Try landscaping your sandbox area with these to deter cats. Some cats dislike the smell of rue, lavender, rosemary, pennyroyal and the aptly named scaredy-cat plant. A motion-activated device designed to deter animals can scare cats away from your sandbox. There are several commercially available options, thought they can be pricy. Scarecrow Motion Activated Animal Repellent retails for about $60 and covers an area of approximately 1,200 square feet. It scares animals away with noise and water. Havahart Spray Away Hydro-Remote Animal Repellent Sprinkler costs about $100 and covers up to 1,900 square feet. The Havahart uses a water spray to scare off animals. It can also double as a lawn sprinkler. SSSCAT Spray runs about $30 and gives off an unscented spray that can startle cats. However, it doesn't have a large coverage area because it's really made for indoor use. You would likely need several to cover the area around your sandbox, depending on the setup. Another important task is to make sure you are properly cleaning the sandbox. Cats have a sensitive sense of smell and will go where they smell traces of urine and feces. Use special cleaners made specifically for cat waste. If you're not sure if the sandbox is clean, get a black light flashlight and run it over the sandbox at night to look for traces. If the culprit is your own cat, you can train him to not use your sandbox for his bodily functions. Simply saying "no" to him and taking him out of the litter box won't do much other than annoy your cat. Instead, identify an incompatible behavior you want him to do instead of getting in the sandbox and work on reinforcing that behavior. Examples may include turning away from the box, playing with a toy you set up nearby or even encouraging him to use a litter box you put outside for him. Clicker training is a great way to do this and can be fun for you and your cat. 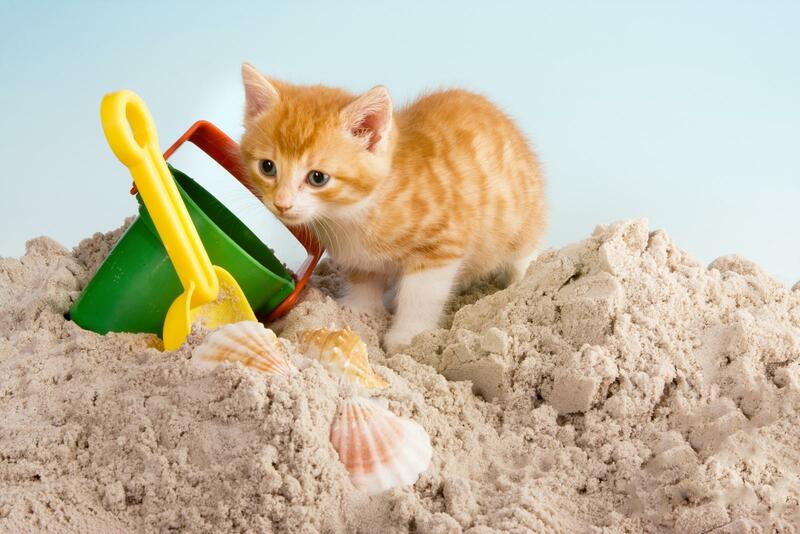 Having cats in a sandbox can also be potentially dangerous for anyone who handles the sand. However, with so many options to try, one (or a combination) of these solutions is sure to help you find a way to keep cats out of your backyard sandbox. You may have to try several different options before you find the one that works best for your situation.